Rubbing needs to be done correctly to get the desired results. We need to have sufficient skill and knowledge to perform a good result in the rubbing process. Exercise and experience is really needed to master the rubbing process. Here are some things that must be considered in the rubbing process. The finish layer must be completely dry. Rubbing is the process of cutting and rubbing the finish layer, the cutting and rubbing can be done with perfect results when the coating film finish is completely dry already. Only the dry finishing layer will reach his maximum hardness that ready to be rubbed. It can be sanded much easier and faster with less risk. The finish layer that is not dry will stick to the sandpaper, with the risk to make deep scratches on the surface. The finishing layer that has not fully cured also continues his drying process until he reaches his maximum dryness. While the finishing layer is shrink along with the drying process. The shrinkage is still occur until it is stopped when he achieve his fully dry condition. When the rubbing is done and finished during the drying process is still running, then rubbing results will change since it still continue to shrink. The surface that is already flat and smooth with the rubbing process turns to down and shrink again and make a different looked. To get the looked we need to wait until the film finish is really dry and redo the rubbing process. How long does it take for the finish layer to dry completely? It really depends on the type of clear coating used and the environmental factors in the drying room. Nitrocellulose clear coating as the most quick-drying materials requires about 24 hours from the last coat application before ready to the rubbing process. The other type of clear coating such as PU, AC or Water based of course need longer drying time. The rubbing with a high gloss, need good preparation in the unfinished wood surface. The higher gloss on the surface will make the imperfectness on the surface shows more clearly. The unfinished problems problems such as: scratches, sanding marks, cutter marks, uneven surface will be more clearly seen in a high gloss finish. Therefore, to get good results the proper preparation should be started in the unfinished work. The flat surfaces such as top table or panel should be ascertained already flat before the finishing process is started. Rubbing with a high gloss will also be disturbed by the existence of the pores and grains that are still open, therefore it is better to make close pores finish for the high gloss rubbing process. Rubbing is process cutting the finish layer until get the flat, even and smooth surface, so it need thick enough finish layer. The finish with thin layer has a high risk to get over sand on the finish layer. That way we need to prepare thick enough film thickness to get rubbed with good result. Usually we need to apply clear coat 6 or 5 times to get enough film thickness, 3 layer of sealer and 3 layer of top coat is mostly used to prepare the finishing layer to be rubbed. It is a very simple process of rubbing. Rubbing is done by rub the surface using steel wool evenly. The steel wool used is the finer steel wool (# 0000 grade). This process can be performed on a thin finish and uneven surfaces. It is also the solution to rub the uneven parts like the legs, carvings and even the side wall, while the top with a flat surface is rub with complete process. 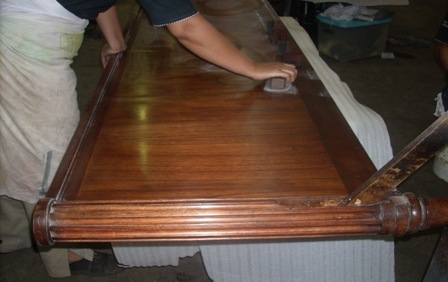 The rubbing must be done consistently since it would determine the appearance results produced. This process will always leave scratches mark (wool mark). The rubbing process that is done consistently will result in the regular and tidy marks on the surface and it make the appearance obtained will be more even and uniform. For a flat surface like top table then we better use the rubbing machine to obtain more consistent and uniform looked. 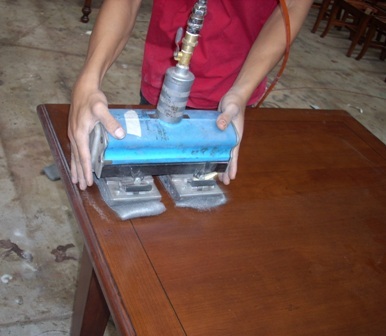 If the finish is too rough, it can be started by sand using sandpaper to get a flat surface. Sanding with # 360 or # 400 grade sandpaper until get the even surfaces, then rub with steel wool to get the looked. This process can also be followed with the application of wax with rag to make a soft and smooth, and wet looked finish. This process will give a soft and nice finish, but will always leave scratches mark. The sheen is depend on how strong and consistent we push and rub. But mostly the final sheen result is about 45 - 60 sheen. Removing stains and rust from automotive paintwork during pre-paint clean ups is an ideal task for steel wool. Fine steel wool can be used to clean wood surfaces before staining or varnishing.